« How can each household reduce its use of electricity in summer time? Popular cake shall be an ‘incubator of reconstruction’! The confectionary of Saito-seika restarted its production line on March 7. Its main product ‘Kamomeno-tamago’ is one of the most famous cakes of Sanriku district in East Japan. They are also aiming at secure of chicken eggs and start production of popular cake ‘Kamomeno-tamago’ from April 20 or so. The confectionary of famous cake, Saito-seika suffered heavy damage from the tsunami, and lost its head office and five direct management stores. Although, one of its confectionary located in the coastline of Ofunato was washed away by the tsunami, other two confectionaries on the high ground, such as Nakai Confectionary, were only slightly damaged and about 250 employees escaped unhurt. They secured one of the main ingredients chicken eggs on April 6. The production line at the Nakai Confectionary made a trial run of cake, where nearly 90% of their cakes are usually produced, and could confirm its line. 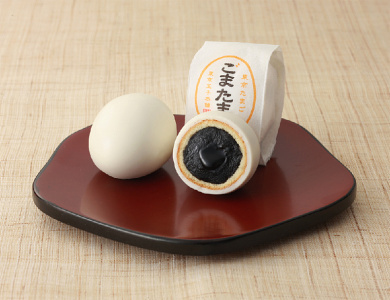 The line made ‘Goma-tamago’ on April 7, which is a similar cake of ‘Kamomeno-tamgo’ mainly deal in the Tokyo metropolitan area. Secure of cake ingredients such as chicken eggs are still unstable. Eggs are supplied every other day now. They are expecting to secure chicken eggs in 200-300kg a day for April 20 or so, which is the same level as before the disaster occurred. “Reconstruction of Eastern Japan won’t be able to achieve without revitalization of local economy. We like to make our line in full operation and shall be the symbol as an ‘incubator of reconstruction’.” Mr. Toshiaki Saito, CEO, strongly expressed.